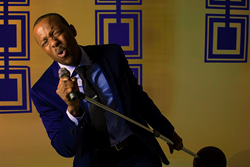 WHAT: Get ready to move and groove as soulful singer Solomon Jaye from vocal super group “The Edge Effect” will bring his smooth sounds and “ol skool” style to Church Street Station at the 16th Annual Florida Music Festival. The highly-anticipated thirty-minute showcase will feature Solomon performing a collection of songs from his debut solo album “Ordinary Man” joined by top Central Florida musicians: KP Capehart (Lead Guitar), Geo Ponce (Bass), Sean Crabtree (Keys), Dayve Stewart (Sax) and Rob Herbert (Drums). WHEN: Friday, April 22, 2016. Performance starts at 6:30pm. WHERE: Cheyenne Saloon, 120 W Church St, Orlando, FL, 32801. HOW: Show is free and open to the public. More information: http://www.floridamusicfestival.com. WHO: Talented singer, songwriter and tap dancer Solomon Jaye has over a decade of distinguished musical highlights, including performing with winners of MTV’s “Top Pop Group,” Boyz II Men's "Next Great A Cappella Group" and “America's Got Talent” finalists The Edge Effect, premiering a solo show on the world’s largest cruise ship Oasis of the Seas, taking center stage in “Hairspray: The Musical” for Royal Caribbean, opening for Robin Thicke and Sky Blue (LMFAO) at the Florida SunFest Music Festival, sharing the stage with Broadway superstar Shoshana Bean, renowned saxophonist Mindi Abair, Las Vegas’ Santa Fe and the Fat City Horns and many more. WHY: The Florida Music Festival boasts over 125 individual showcases each year and emphasizes promoting the community of music. Each night, FMF invites individuals, artists and all music enthusiasts to come together to celebrate an artist or band that defines their genre. Over a dozen stages take over Downtown Orlando from Thursday, April 21 to Sunday, April 23 rocking all genres from Pop, Hip Hop and Alternative Rock to Country and Blue Grass. All participating showcase venues are free admission. For more news and information on Solomon Jaye, visit http://www.solomonjaye.com and http://www.facebook.com/sjmusic. See Ordinary man in action at https://youtu.be/kZinVQEtKIA.